Big card of NHL betting action for Saturday and we’ll take a look at a Central Division matchup between the Nashville Predators and St. Louis Blues. The Blues are a tough team to figure. They bumbled through the first half of the season but have finally started to show some moxie in the past month. St. Louis enters this game having won 4 straight and 7 of their last 10 (7-2-1). A big part of the Blues’ recent success has been the stellar play of rookie goaltender Jordan Binnington who has taken over the starting job from veteran Jake Allen. Binnington enters this game with a record of 8-1-1, a 1.70 goals against average and a 0.931 save percentage. He got his second career shutout in his previous game, a 1-0 victory over Tampa Bay. It was a goaltenders’ battle throughout with the Blues finally taking the win in a shootout. One of the most impressive things about Binnington is how quickly he’s adapted to the workload expected of a starting NHL goalie. Binnington has started seven straight and 11 of the Blues’ last thirteen games. He’s projected to get the start here though the Blues might want to give Jake Allen a spot start. This is the first of a quick home and home series between the Blues and Nashville with the second game tomorrow afternoon at the Bridgestone Arena. For that reason you have to think that Allen will start one of the two games. Pekka Rinne is listed as the projected starter here for Nashville meaning that Jussi Saros will likely go in tomorrow’s rematch. When the Predators are playing well they’re tough to beat. At this point, everything is going well for Nashville with the exception of the power which has been inexplicably bad this year. The Predators are #11 in goals per game but #31 on the power play scoring just 12.8% of the time. The penalty kill is just fine (#12 81.4%) and Nashville has the #2 scoring defense in the league. Making Nashville’s power play issues all the more inexplicable is that there’s no apparent reason for the struggle. The Predators’ get great puck movement on the man advantage and have plenty of guys capable of putting the puck in the net. Even so, they’re not scoring. If anything, they may be *too* patient on the power play–they’re so good at moving the puck that there’s a tendency for them to pass off on a good shot hoping to find a great shot. The word from the Nashville locker room is that there’s not too much concern over the power play at this point. They’ve got the players and the players are good at executing the tactics. The thinking is that they just haven’t had good ‘puck luck’ on the man advantage and that a turnaround will come sooner rather than later. The Blues could be in something of a letdown spot here after beating the best team in the NHL on their home ice. The Lightning have the best home record in the NHL so it’s no small accomplishment to shut them out on their own ice and even more so for a rookie goalie to do so. That’s one reason it might be wise to start Allen here and come back with Binnington tomorrow. No matter how they want to do it the Blues can’t come out slow in this game. Nashville is just too good to be in ‘letdown mode’ against. More problematic–the Blues have been awful at home this season with a 12-13-2 record for a net loss of -7.2 units. Nashville typically isn’t a great road team but they’ve been very capable this season with a 15-9-4 record away from Bridgestone Arena. Taking points in 19 of 28 road games is the hallmark of a very solid and focused team. 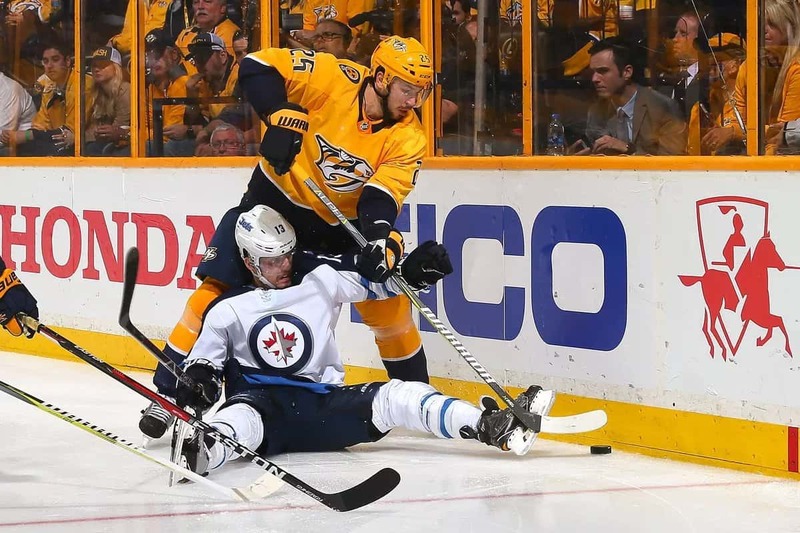 The Blues ripped Nashville 6-2 when the Preds played here in November but the visitor has been very strong in ‘revenge’ games this season (14-6 +3.6 units). Nashville looks to be in good form now winning five of six and St. Louis might be flat here–particularly with a rematch on deck less than 24 hours later. Can’t pass up Nashville as an underdog.